Despite rising tuition and course fees, the high cost of time and money for higher education still pays off for most people, and in most areas. Each year of additional schooling increases a worker’s earning by an average of about 10 per cent. Those with a four-year undergraduate university degree can expect to be paid, on average, 40 per cent more over their lifetime than those with a high school education. 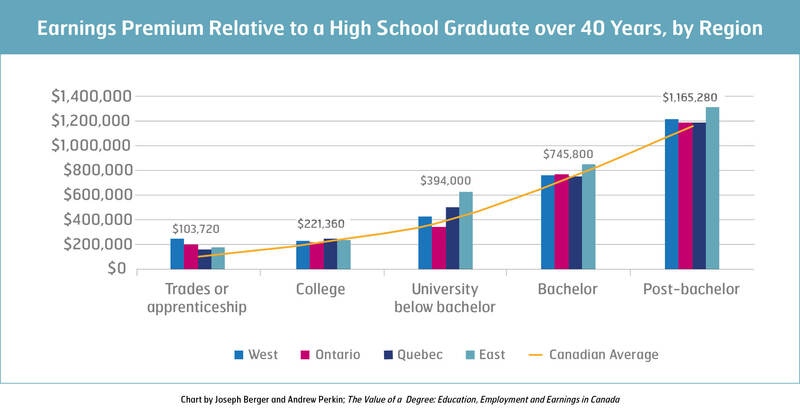 Those with a two-year college certificate make on average 20 per cent more. These figures are averages, and there is a lot of variation depending on field of study, occupation, gender, province, years of study, and other individual characteristics. In higher paid fields such as medicine, engineering, law and business, students can expect returns around 15 per cent. In fine arts, it’s closer to five per cent. While there is a high monetary return for most college certificates and undergraduate university degrees, the rates of return tend to decline with more advanced degrees, but they are still solidly positive for most master’s programs and especially for MBAs. There had been little additional monetary benefit to many PhD degrees—students were doing them for the love of knowledge or other reasons—but more recently, the PhD payoffs seem to be rising. Someone with a college degree can expect to be paid an average of $220,000 more than a high school graduate over 40 years. A bachelor’s degree is worth $750,000 extra and a post-graduate degree more than $1 million extra. These higher earnings also translate to higher tax revenues, so governments benefit as well. Those with higher education are less likely to be unemployed, to be laid off, to depend on government transfers, and more likely to have a workplace pension—so higher education pays off in other ways as well. If we consider what individuals pay (and give up in terms of lost earnings) for education and what society pays in terms of support and subsidies for education, these private individual and social rates of return also average close to 10 per cent. Of course, a post-secondary degree isn’t for everyone. Many people can make more money and, more importantly, get more life satisfaction, without one. But everyone should have the opportunity to pursue post-secondary education if they want to, without the cost of tuition being a barrier. The bottom line is that investing in education pays off, both for individuals, for governments and for society in general, and often much more than most other investments — except joining a union!